While continuing to lament the demise of the Crewlet Striped linen-cotton sundress, I re-discovered this skirt in my closet on Saturday. I purchased it several months ago in an attempt to replace the derby dress hole in my closet. The navy and red stripes were similar to the dress and while not as easy as tossing on a dress, it seemed like a comfortable skirt. I tried it on (it fit!) and stuck it away in my closet. Now that it’s warm enough to wear the skirt, I forgot just how much I like it and how well it fits. It’s longer than the sundress and I can pair it with a tank, tee or blouse depending on how dressy I want to be. I decided to go the casual route for running Saturday errands and ignore the fact that the stripes on this skirt are navy and went for my Kate Spade graphic tee and Target thong sandals. Wearing this skirt made my decision final to return the dress and not fight with the fact that it doesn’t fit me. It was hot and sticky out so with my hair up in a top-knot and some over-sized cat-eye sunglasses I felt pulled together to run errands in the heat. Speaking of stripes, my fashion goal this week is to not wear any stripes! I’m glad to have this skirt in my rotation though, it is very comfortable and I wish J.Crew had made it in a solid color or two as I’m going to have to get creative to make up multiple outfits with these stripes. So, what do you think? 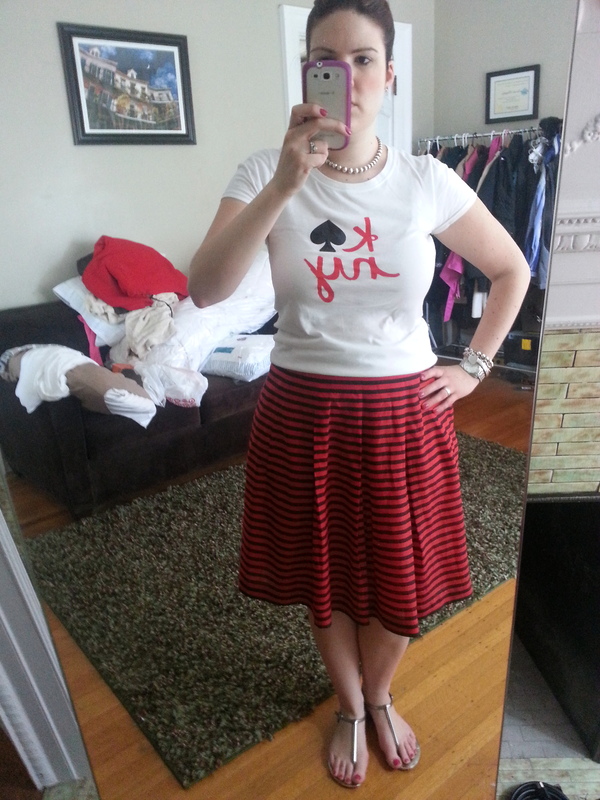 Is the skirt a good replacement for the failed derby dress? Would love to hear what you think and thanks for visiting!